By the narrowest of margins, the U.S. Senate voted Tuesday to confirm Betsy DeVos to be the nation's new education secretary. A 50-50 deadlock over her confirmation was broken by Vice President Mike Pence, who became the first vice president ever to cast a tie-breaking vote for a Cabinet nominee. The vote to confirm DeVos came after Senate Democrats staged an all-night Senate talkathon Monday evening, a tactic to draw attention to their opposition to the Michigan billionaire who has no experience working, attending or volunteering at a public school. 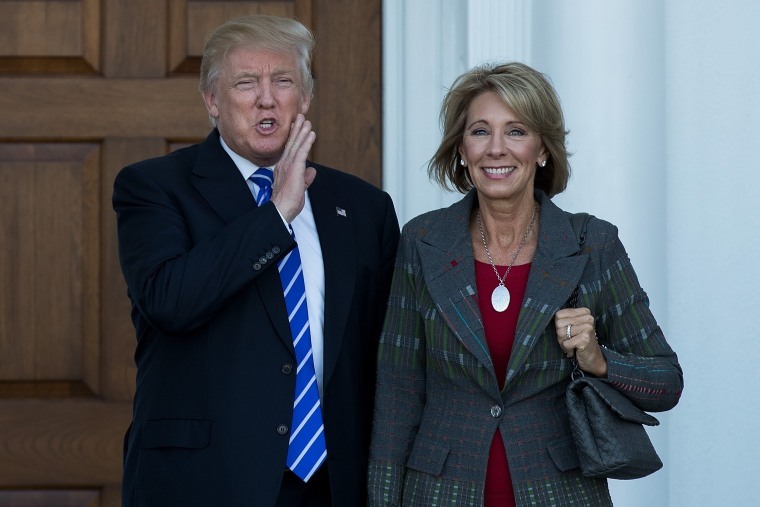 DeVos becomes the sixth Cabinet appointment of President Donald Trump's to be confirmed. Pence was needed to break the tie after two Republicans, Susan Collins of Maine and Lisa Murkowski of Alaska, announced their opposition to DeVos last week. The rural state Republicans said DeVos lacked the experience to understand "the challenges" facing public schools. Democrats' unified opposition to DeVos came after a nomination hearing at which critics said she failed to demonstrate a deep understanding of education philosophy. Just before 10 p.m. Monday, an exasperated Sen. Al Franken, D-Minnesota, recalled on the Senate floor his exchange with DeVos during the hearing last month, at which he asked whether she was partial to an educational philosophy in which children are measured on growth within the academic year or on proficiency of a grade level. "She had no idea what I was talking about," Franken said. "I can't overstate how central this issue is to education." Clips from the hearing that circulated on social media further mobilized opposition to DeVos. While she was one of the eight Cabinet nominees against whom Democrats originally said they would mount an opposition campaign, the public fury over DeVos surprised even them. Supported by liberal groups and local Democratic parties, calls flooded into Senate offices, jamming phone lines, pressuring Democrats to fight her nomination and urging Republicans to oppose her. Sen. Heidi Heitkamp, D-North Dakota, said that most of the calls she's receiving are about DeVos and that 90 percent are in opposition. And Sen. Bob Casey, D-Pennsylvania, has received more than 100,000 calls opposed to DeVos, more on one topic than he's had since he entered the Senate in 2007, according to a Democratic aide. In addition, rallies have been organized at Senate district offices around the country. Such pressure successfully influenced Murkowksi. Democrats have also expressed concern that DeVos is philosophically opposed to public schools — and her business ties raise questions about conflicts of interest. She has personally invested in private and charter schools and has been an outspoken advocate on both. While they couldn't stop her confirmation, Democrats did make it as painful as possible. And they plan to use a similar delay tactic for more nominees, including for Sen. Jeff Sessions, R-Alabama, to be attorney general. The Senate is expected to move to his confirmation next. The strategy allows time to mount public opposition but also to use up valuable floor time that will backlog legislation that Republicans and the Trump administration wish to pass this year, including health care reform. Republicans plan on votes to confirm treasury secretary nominee Steven Mnuchin and Rep. Tom Price, R-Georgia, to be secretary of health and human services. The Democrats' strategy could force a vote on Mnuchin into Saturday morning, a day of the week the Senate rarely works. Republicans have sharply criticized the Democratic tactic. Sen. John Cornyn, R-Texas, called it "juvenile," and Collins said it's "not really fair." "I don't really understand the point of their tactics. It's not going to have an influence on the final vote," she said specifically of Democrats' delay of DeVos.